In the early 19th century, Chile's independence from Spain brought on a clear preference for the trotting stock and/or warhorse. This "blue collared" equine variety that had always dominated the country's inventory, now also became the most prestigious breed elected to represent the newly formed Republic of Chile. Unlike the Araucan War against the Mapuches that was fought by professional soldiers on militia horses, the war of emancipation put every citizen atop his favorite mount and the attributes of the Chilean trotter was more deeply appreciated by the average citizen. In this period Chile had its most influential breeders. In 1858, one such breeder, Pedro de la Cuevas, produced an extraordinary dun horse named Bayo León that became the model all Chilean Horse breeders would try to emulate. This horse was known for his speed, his cowhorse aptitudes, his incredibly docile temperament and a picture perfect conformation. The breeders now more closely defined the desirable characteristics of the Chilean Horse. During the 34 years of the Bayo León influence also introduced a greater selection for speed, as his offspring made match races at sprinting distances extremely popular throughout the country. To this day, speed rather than endurance is the criteria by which "huasos" (Chilean cowboys) value their horses. The end of the nineteenth century brought with it a decline in agrarian property sizes, the use of thrashing machines that extinguished the need for thrasher mares, railroads and automobiles that greatly limited the use of the horse as a means of transport and the growth of specialized breeds that substituted the Chilean Horse in draft, carriage and racing needs. The saving grace of the Chilean Horse was the upsurge in the popularity of the Chilean Rodeo. Between 1856 and 1860 the aptitudes of driving and directing cattle in the raceways to the classification corrals of ranch roundups were put into test in a circular arena with a series of sporting rules that remained unchanged until 1920. This was made even more official when in 1869 the National Society of Agriculture organized a national livestock exposition that culminated in a large rodeo. As the practical uses for the Chilean Horse were substituted by advents of progress the Chilean Rodeo became both the motivation and justification for Chilean Horse breeders. Meanwhile the aptitudes required to excel in this sport were increasingly implanted in the breeding of the Chilean Horse. The Chilean horse prior to 1850 was a closed breed type, due the absence of European breeds in a country that was convinced they had the best horses in South America. The isolation that resulted from the geographical definition of its borders also made imports less probable. When modern transport made new breeds more accessible, Chile was one of the last places in South America to see them arrive. Even so, the innumerable mountains, ridges and valleys over a 4,300 km (2,700 miles) long landscape assured that the purity of many Chilean Horses remained intact. Faithful traditional breeders also were vital contributors by not succumbing to the temptations of crossbreeding. Although the registry was established in an effort to protect a "national treasure" that was being endangered by the popularity of crossbreeding, the Chilean Horse already had more than a century of selection along specific family lines. Yet, nothing has assured the purity of this breed more than its specialization in a sport for which it now has been exclusively selected for over a century and a half. As the Chilean Rodeo became the main objective of the Chilean Horse, outcrossing to other breeds was an unreasonable alternative since the Chilean Horse was undoubtedly the most suited for this sport. 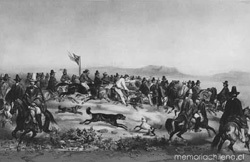 The critical period that popularized the use of other breeds was shortened even more when Chile became the first country in America to register their national breed of Iberian origin. The real stroke of genius was formalizing and popularizing a sport where no other breed could be its equal.